The United States has recently seen a rapid increase in participation of young athletes with organized youth soccer leagues. As parents spend more time around the sport they become very familiar with the injuries associated with this sport. They begin noticing that lower extremity injuries are more common and that there are many more injuries associated with the women's teams than the men's, especially knee injuries. Although soccer has a low rate of injuries compared to other youth sports, current literature reports that the lower limb, specifically the ankle and knee, are the body parts most often injured in youth soccer. The anterior cruciate ligament (ACL) is one of the major stabilizing ligaments in the knee. The majority of ACL injuries in sports occur in the absence of physical contact with other players at the time of injury and are categorized as non-contact ACL injuries. It has been shown that the female athlete involved in cutting sports (soccer, basketball and volleyball) is 4 to 10 times more likely to sustain a sports-related non-contact ACL injury than male athletes. Also, we know that the knee has a nearly sixfold increased risk of reinjury with a previous injury to a knee and the ankle has a fourfold greater risk of reinjury if the athlete had a previous ankle injury. A prior injury is one of the single best predictors of future injury risk and ACL injuries to the opposite knee are even more common than reinjuries of the initial knee. Figure 1. ACL injuries typically occur immediately after a landing when the knee is nearly straight. The Cost Of An ACL Injury Goes Beyond Dollars! The cost of an ACL rupture is costly with conservative estimates of surgery and rehabilitation at $17,000 to $25,000 per injury. Additional costs include loss of entire seasons of sports participation, loss of scholarship funding, lowered academic performance, longterm disability, chronic knee instability, secondary damage to menisci and a 10-times greater risk of degenerative osteoarthritis of the knee. A variety of factors have been explored to account for the gender difference in susceptibility to ACL injuries: ACL size; knee joint laxity; standing posture, foot pronation ("dropped arch"), misalignment of the lower extremity, and pelvic position; and hormonal variations. Furthermore, they have explored shoe-surface interaction; playing surface; skill level; level of conditioning, muscle strength, and altered neuromuscular controls. With regard to environmental, anatomical and hormonal risk factors, there is no conclusive evidence that any one single risk factor correlates directly with an increase in ACL injury in female athletes. Therefore, the emphasis has turned to biomechanical risk factors and the use of neuromuscular and proprioceptive intervention programs to address potential biomechanical deficits. Preventing ACL injuries is paramount. ACL injury reconstruction surgeries are complicated for adolescents and often have poor results. On the other hand, the natural history of untreated ACL injuries in adolescents is not acceptable. Because of the concerns with surgical and nonsurgical treatments of ACL injuries in adolescents, ACL injuries are more devastating for adolescents than for adults, and the early training for prevention of noncontact ACL injuries in adolescents is important. Understanding injury mechanisms is a key component of prevention of non-contact ACL injuries. Mechanically, ACL injury occurs when an excessive tension force is applied on the ACL. A non-contact ACL injury occurs when a person themselves generates great forces at the knee that applies excessive loading on the ACL. This can occur in a number of ways: sudden deceleration, repeatedly performing landing and pivoting maneuvers (Figure 2), one-step/stop deceleration, cutting movements, sudden change of direction, landing from a jump with inadequate knee and hip flexion (at or near full extension), or a lapse of concentration (resulting from an unanticipated change in the direction of play). Figure 2. A landing and pivoting maneuver. ACL injuries typically occur immediately after landing during a deceleration maneuver combined with a change of direction while the foot is in a closed-chain position (planted on the ground). 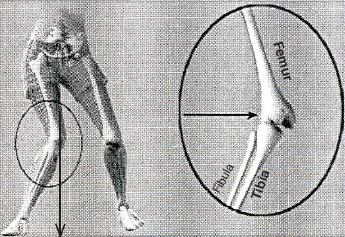 While the foot is planted and pronated (rolled in), the tibia of the lower leg is internally rotated (turned inwards), and the knee is nearly straight (at or near full extension. Figure 1). If the athlete attempts to change direction, the result is an excessive torsional force that can potentially strain or rupture the ACL. Figure 3. 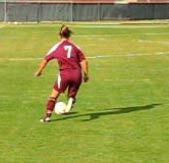 A typical falling pattern that demonstrates an increased risk for an ACL injury. A longitudinal study of children 5 to 12 years of age in youth soccer demonstrated that there is no gender difference in knee injury risk before puberty in athletes. 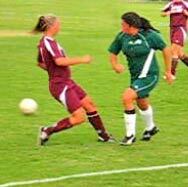 However, age older than 11 years was a significant risk factor for knee injury in girls. Compared to their male counterparts, changes that occur in the female athlete while performing a stop-jump task include: decreased knee and hip flexion angles at initial contact, a tendency to land with the lower extremities more extended, and they maintained knee valgus (Figure 4) at initial foot contact with the ground. The degree of these changes increased with age. The literature indicates that the ACL injury rate in adolescents increases linearly after 12 years of age and that adolescents at 17 and 18 years of age have the highest ACL injury rate. Comprehensive training can lead to improvements in athletic performance and movement biomechanics as well as reduce ACL injury risk in female athletes. The processes that reduc ACL injury rates appear to be relatively similar, arising from a common rationale derived from performance enhancement training and physical rehabilitation for athletes. Improving Technique Is The Answer Emphasis of training should be on proper technique: landing softly, increase knee flexion, minimize knee valgus (align the center of knee cap with the first toe). Improving running technique to include accelerated rounded turns, decelerate with a multi-step stop, and maintain proper knee alignment and knee flexion during cutting maneuvers. Strength conditioning should focus on increasing hamstring, gluteus maximus, gluteus medius (hip extension and abduction) strength and reactivity. Located in Roseville, California, Wayne Nelson, DC, CCRS, is a board certified Chiropractic Rehabilitation Specialist and has over 17 years experience in rehabilitation, sports medicine and performance training. If you have any questions about preventing injuries or improving your fitness for soccer you can contact Wayne at ConditionForLife@comcast.net. Figure 5. Important muscles of the thigh.